Sudden cardiac arrest is a leading cause of death in the United States, and both adults and children can be victims. Prompt defibrillation and CPR offer the best chances of survival following cardiac arrest. In fact, survival rates from out of hospital cardiac arrest increase 10-fold when bystanders perform CPR and apply an Automated External Defibrillator (AED). CPR/AED training is essential to increasing the survival rates from out of hospital cardiac arrest in NYC schools. Enacted in 2002, State Education Law Section 917 requires public school officials and school administrators in New York State to ensure the presence of at least one AED in each school building/annex. There must also be an AED on-site when a school-sponsored athletic event is held at a site other than a public school. Additionally, State Education Law Section 917 requires public schools to provide staff with CPR/AED training so they can respond to medical emergencies. However, training people in CPR and purchasing defibrillators does not necessarily guarantee that lives will be saved. The New York City Department of Education (DOE) recommends that each school have at least six AED/CPR trained responders, but this may not always be sufficient. Furthermore, school administrators may prefer staff members to undergo first-aid training in addition to AED/CPR training, though it is not a requirement. It’s ideal for school staff to have some level of first-aid ability since medical emergencies can occur at any school, at any time. First-aid training prepares staff to respond to emergencies like breathing problems, chest pain, low blood sugar, stroke, etc. And although NYC schools are only required to have one AED in each building, some school administrators may prefer to have more AEDs available so they can respond to emergencies as quickly as possible. For NYC schools that want to take matters into their own hands and go beyond New York’s AED/CPR training requirements, investing in private first-aid and CPR training in NYC might be a better option than taking the free classes offered by the NYC DOE’s contracted vendor. Outlined below are the benefits of using private CPR training services in NYC. Comprehensive Onboarding Process – Private CPR classes can form part of a school HR department’s onboarding process for new hires. Private CPR training makes for a more comprehensive onboarding process by acclimating new employees, helping them become effective organizational members, and making them feel better informed, prepared, and supported. Emphasis on Team Approach – Private CPR training builds team spirit among existing staff. At EMC, we take a team approach to safety administration, protocol, and execution. Training with a team approach to CPR is important because teams of rescuers perform several actions simultaneously. EMC develops an operational protocol that clearly defines the actions of rescuers during an emergency. Communication between team members is particularly crucial while performing chest compressions because the person performing them might eventually get tired and need someone else to take over. 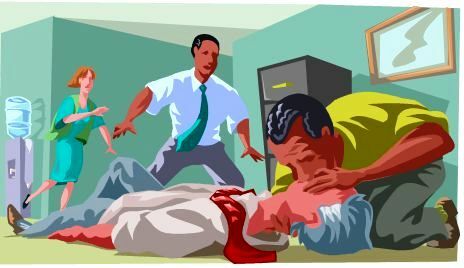 Effective Training on Proper Response to Emergencies – EMC trains and equips personnel to immediately recognize sudden cardiac arrest and provide early defibrillation and CPR with an emphasis on chest compressions. In addition, our private first-aid training classes prepare staff to effectively respond to a variety of injuries and medical and environmental emergencies. Preventative and Proactive Approach to Safety – Taking a preventative and proactive approach to staff and student safety raises awareness, enhances skills, and contributes to everyone’s overall well being. Rally Greater Organizational Commitment to Proactive Health Consciousness – Private CPR training in NYC can help schools rally greater organizational commitment to proactive health consciousness. EMC’s CPR and first aid classes are taught in a fun, stress-free environment and prepare school staff to save lives. Confidence-Building Exercises and Testing – Oftentimes, members of the public that have received CPR training lack the skills and confidence necessary to save lives with CPR. EMC offers confidence building training exercises and testing in order to produce effective emergency responders for schools. Our CPR/AED courses boast high levels of involvement and interaction, so they help grow the confidence of participants tremendously. Employees walk out of the classroom feeling equipped to respond to a real-life sudden cardiac arrest emergency. Preparation for the NYC DOE’s Unannounced Drills – The NYC DOE conducts two unannounced drills at each school building during the academic year to refresh skills learned during CPR/AED training. As part of EMC’s private CPR/AED training classes for NYC schools, we prepare staff for these drills. A prepared school is a safer school. EMC offers CPR, First-Aid, and AED training in NYC for school staff and faculty. We utilize state-of-the-art equipment and emphasize hands-on training because studies show that adults learn the best through “doing.” We also provide school staff with unlimited access to phone consultations for the length of their certifications. For more information about EMC’s NYC CPR training services, please call 1-800-695-5655 or fill out our online contact form. Founded by New York CPR expert Stephanie Duehring, EMC CPR & Safety Training, LLC offers American Heart Association, ASHI, ECSI, and Red Cross CPR/AED/First Aid classes. We utilize a hands-on learning approach that leads to high comprehension and retention levels among students. The company offers on-site training for businesses nationwide, including New York City, Los Angeles, Chicago, and Houston. Get CPR training for your team! How Do Good Samaritan Laws Work? ergfir nolikz on How Do Good Samaritan Laws Work?